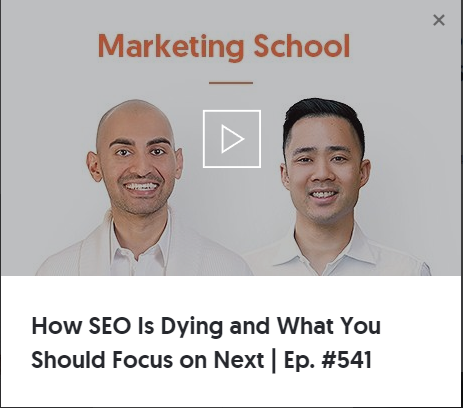 Neil Patel is totally wrong about the death of SEO and the counter strategies he recommends. Just asking whether SEO is dead makes him cringe, smirk, or cry. People have been saying “SEO is dead” ever since SEO was born. He goes on to agree wholeheartedly that SEO is not dead. So what’s gotten him to change his mind? Best I can tell, trends in Mobile and particularly with Voice search put the SEO is Dead bee into Neil’s bonnet. Mobile rose rapidly over desktop and most experts think it either is the most important thing or shortly will be. 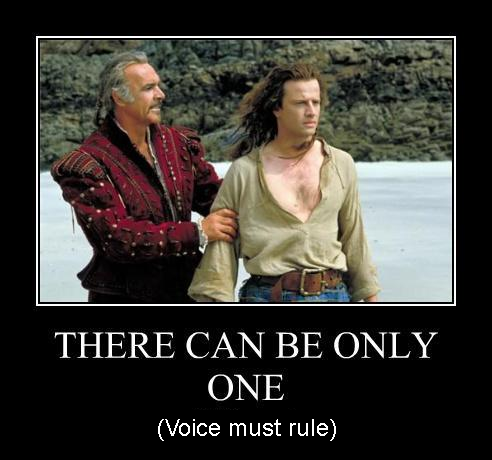 Voice is the natural UI for Mobile, so if Mobile rules, so will Voice. And BTW, Voice comes into play in Home Personal Assistants (like Amazon’s Echo) now too, so it has another Megatrend Tailwind driving its growth. As Rand Fishkin points out in Moz, the most likely result of conversational search is that only the top result will be displayed. If there can be only one search result for the majority of searches (which will be Voice), then the future is clear and it ain’t SEO. Why Traditional SEO is Dying. Because Baruch Labunski, supposedly the “leading SEO and marketing expert of today” (!) says today’s users aren’t even on search engines most of the time. No one uses search engines on mobile devices anymore. And then there’s voice search. BTW, 66.54% of Labunskis web traffic is via SEO. SEO in 2018: Optimizing for voice search. This article from influential Search Engine Land has Bryson Meunier focusing on Voice Search, just like Neil does in his podcast. And Voice Search focuses on Google Featured Snippets. So again, no opportunity for others to get any traffic from a Voice Search. Meunier works for VividSeats.com, which gets 60.62% of its traffic from SEO. How Voice Search will forever change SEO. Voice search is hot, hot, hot, and this article from Search Engine Journal has a lot to say about it. Google says Voice Search is the fastest growing type of search (hey, the new thing always is, but that doesn’t mean it will win). 55% of teens and 41% of adults use voice search daily. It’s faster, hands-free, let’s you multi-task, and it’s considered cool! It’s increasingly reliable as the error rate for voice has fallen from 20% 2 years ago to 8% today (don’t assume that pace continues to perfection). The Death of Organic Search (as we know it). In this article, Dave Davies talks about Machine Learning and the Erosion of Organic Space (e.g. search results displaced by ads, snippets and more). His money quote, “Google is crafting the results layout in a way that minimizes the impact of organic results on commercially intent searchers.” He follows Patel’s logic by noting that Mobile Traffic surpassed desktop in mid 2016 and Google is moving to a Mobile-first index. Traditional SEO is Dying. This article appeared in Skyword by SEO specialist Frantz Augustin. Augustin worked on a website redesign project and discovered that even though they didn’t use SEO, all the KPI’s were trending up and search was more than 50% of traffic. He says traditional SEO doesn’t deliver the results it used to and, “You can’t game the system.” I’ll provide a compelling argument below for why you can still game the system and probably always will be able to. Ironically, those were just the top results I got from Google search for “seo dying voice”. No, I didn’t use a Voice Search to learn that Neil Patel is in good company with his prediction. 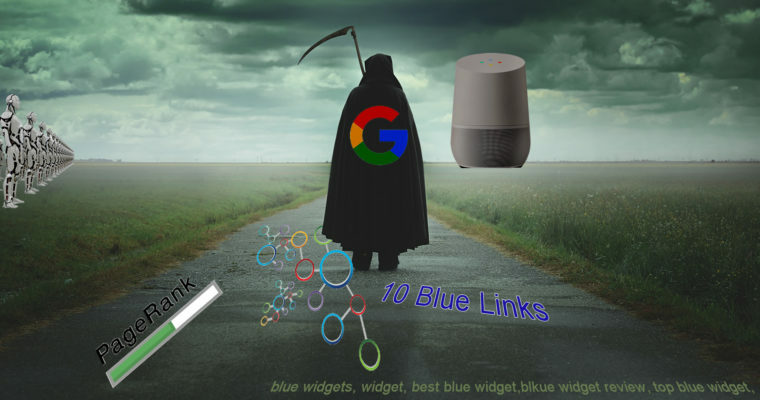 The demise of SEO has been predicted endlessly, and it’s no more right this time than before. Let me explain why. This is where Baruch Labunksi, when he says most users aren’t even on search engines most of the time misses the point. It takes me just a few keystrokes and a few seconds to enter a search and then I may spend ten minutes reading the articles I find from that search. It was the Search Engine that put me onto those articles, so it doesn’t matter how long I spent in search. In fact, the less time I spend getting to a result worth investing my time in, the happier I am. You may have noticed that when I was listing other SEO-is-Dead articles, I kept mentioning how much of the author’s traffic was coming from SEO. 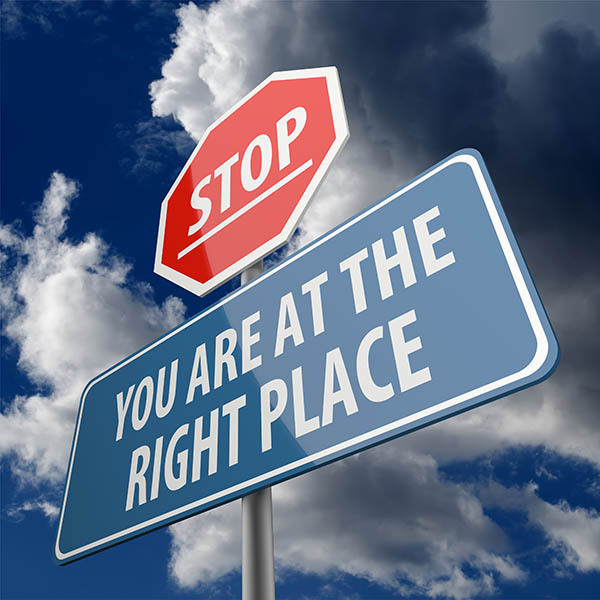 I just want to underscore that SEO rules the roost today for virtually every successful web site. BTW, Voice doesn’t change that. Whatever mechanism you use to get the results you want to consider is a Search Engine. The gist is that despite many claims to the contrary, AI is not going to take all the jobs any time soon. BTW, I’m very familiar with AI and its various techniques. I’ve built three different companies that used similar techniques to good effect. It isn’t that I don’t believe in AI per se, just that I understand it’s limitations. AI has been through the hype curve multiple times already over the years. It’s such a compelling dream, that we keep resurrecting the hype. Voice and Personal Assistants: Also Over-Hyped? You’ll see more humor like this, a lot more. AI is nowhere close to being as smart as people and won’t be for the foreseeable future. Every time someone is telling you something is, “The fastest growing” whatever, as they are with Voice and soon Personal Assistants, stop and assess what impact that has for your business. Is my business built on chasing the latest hype, fashion, and trends or something more solid? Do my customers always embrace the latest greatest or are they more mainstream? At the present rate of growth, how long before the new new thing takes over enough to really impact my business? Adoption estimates range from 30% to 50% of all searches. BTW, in 2016 Google’s CEO said Voice Search was 20% of Mobile Search and in 2010 Google’s CEO said it was 25%. Did it drop or did they quote the wrong numbers? Anywhere from 19-40% use Voice Search daily. 95% of mobile users have tried their voice assistants but only 1/3 continue to use them. The numbers are flaky in that they span pretty broad ranges. If it turns out the reality is at the low end of the range and worse if that falls through dissatisfaction, all predictions of Voice taking over are suspect. Google is seriously limited on how much it can spend to process searches. Google processes 1.2 Trillion searches a year, and that grows steadily. It spends over $28 Billion a year to process that work. That means it can spend about 2 cents per search. But, it’s actually less because the $28 Billion pays for everything Google does, not just searches. Let’s take one of the major AI accomplishments of our day, Deep Blue beats the human world chess champion. To play a relatively few games and win against humans, the Deep Blue hardware cost about $100 million. Let’s assume we get the normal Moore’s Law doubling of performance every 2 years. 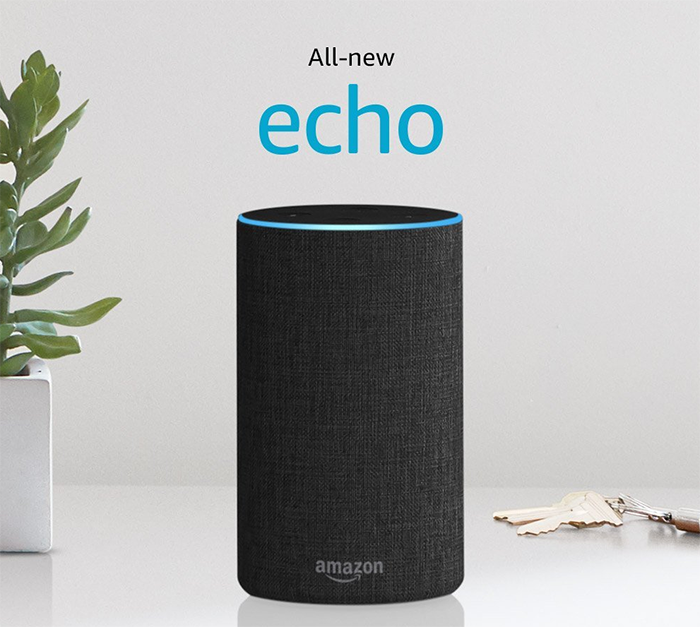 How long before we can create a Deep Blue computer that costs what the Amazon Echo personal assistant cost? The answer is that you’ll have a machine with the cost of an Amazon Echo (about $99) and the performance of Deep Blue in 2034. And let’s be absolutely clear, that’s not a general purpose AI, that’s a machine that knows how to do nothing but play chess. 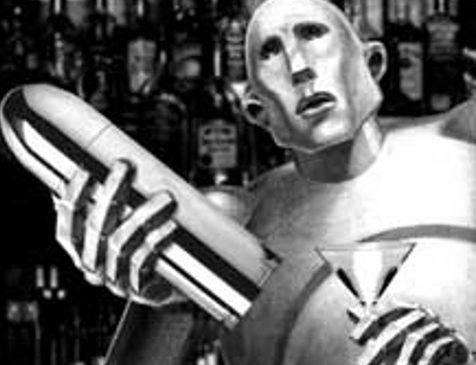 Now how long before we can apply that much AI to Google’s 2 cent query goal? The answer is 2060. Until then, despite all talk of things like RankBrain, Google’s algorithms are going to be limited. Plus, we don’t even know yet whether a dedicated Deep Blue machine can do queries as well as the human mind, we only know it can play chess. People are fond of saying, “Here’s my 2 cents,” when they don’t want you to take their answer too seriously. Google literally can only afford to give you 2 cents worth of attention. Here’s a fact–Google hates people gaming their system. Their algorithms even provide penalties if they catch you at it, both automatic and manual. As long as that happens, you’ll know the system is gameable. And gaming the system is what SEO is all about. Gaming happens because the algorithms are too limited to see through it. They’re too limited for two reasons. First, as we discussed, Google can’t afford to spend much on its algorithms. They’re not omniscient. 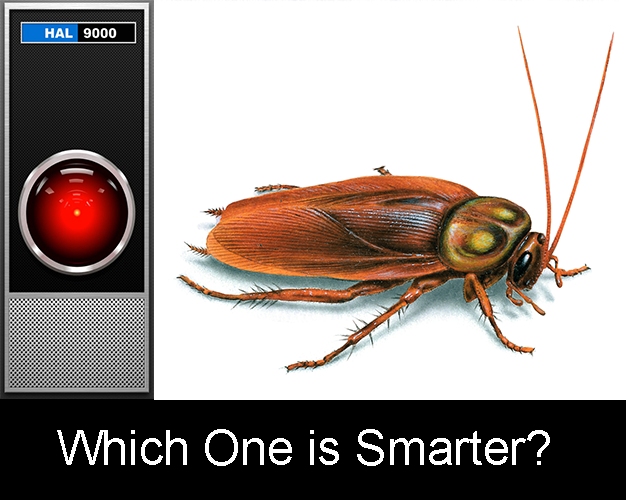 If you like the analogy of my AI article series, they’re probably not even as smart as a cockroach. As long as the algorithms must be limited, they can be gamed, and SEO will not die. What is a Search Engine Result Page (SERP)? As Google users, we see it as the answers to our search. But, as a business how does Google see it? Simple, it’s ad inventory. The more opportunities they have to sell ads and the higher the prices they sell for, the happier Google is. We’ve seen them carve out more space for ads on the SERPs. We’ve seen them offer things like snippets that keep you on Google longer. That all contributes to their ad inventory. Now along comes Voice Search. It gives one answer. There is no SERP with multiple ads, snippets, and search results. That means Google has far less ad inventory. Do you see where this is going? Google has no financial incentive to let Voice Search take over everything with only one search result because it reduces the inventory they have to sell! Google itself will use all of its resources to make sure that Voice Search is additive to overall search volume and that it’s not a zero sum game. So forget all my technical mumbo jumbo about AI. Trust Google’s profit motive. That’s not hard to believe in, right? Speaking of Google’s profit motive and making sure that Voice Search is additive to overall search, I want to touch on how that will be done. Bryson Meunier does a great job talking about how mobile and voice search have contextual clues like GPS location information to help inform the searches that are just not available on the desktop. The thing is, people will use Mobile, Voice, and Personal Assistant searches to satisfy particular intents. These devices, despite whatever gross share they may have of all searches, are better suited to certain intents than the desktop. Conversely, they’re more poorly suited for other intents than the desktop. I delete as much as I can without responding. I flag email requiring urgent or response so I can handle it better at my desktop. I may respond to emails where a very short response suffices. Because my iPhone is limited. I can’t see as much as on my desktop and I can’t type as easily, fast, or as much. What movies are showing nearby? What good restaurants are nearby? Is the price on this item at this store good or can I buy it cheaper online? What are my friends doing right now and can I join them? I need to answer a question to settle a friendly bet at the local tavern. I don’t need to exhaustively research the topic, I just want the simple plausible answer. I need to get directions or perhaps a phone number for a local business I’m en route to. Those are all great examples of intent often better solved via mobile (and/or Voice) than a desktop. The point is that the searches that work better on mobile are not the entire universe of searches. It isn’t clear they’re even the majority of searches. When we consider Voice, consider that it satisfies intent even more narrowly because it’s only good when the algorithm can provide just one answer that satisfies the user’s intent. And keep in mind the cost limitation on coming up with that answer. Let’s assume all of my other arguments go by the wayside and Google quits providing multiple search results. Just because Google has quit providing multiple results, does that mean nobody wants multiple results? For example, I’d much rather not see so much SERP space taken up by ads and snippets. They seldom contain the answers I’m looking for in my searches, so I have to dodge them. Do you agree? But, in fairness, they have to pay their bills. But, imagine they become so greedy each page has just one real search result and the rest is advertising? I don’t think it’s too much of a stretch to think that at some point, Google will go too far and people will start switching to competitors. After all, despite how successful they’ve been, there are still plenty of other search engines if you want to use something other than Google. 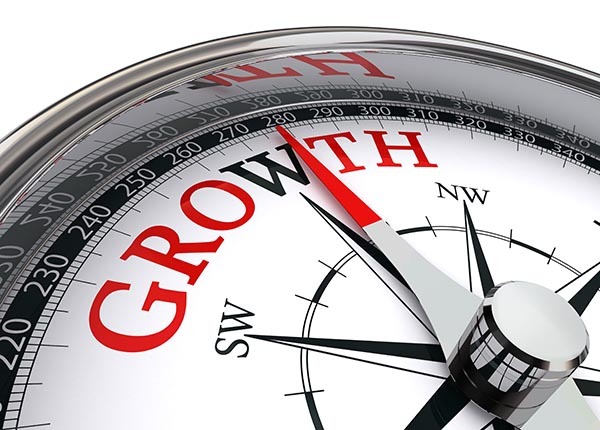 What should your growth strategy be? I hope by now I’ve convinced you that SEO is far from dying and is certainly not dead. What are the alternate strategies recommended by Neil Patel? Focus on where the attention of our audience is focused. Gary V. focuses on Instagram and YouTube because that’s where the audience hangs out. BTW, even Gary talks about the importance of owning a blog and that these other media are just gateways to get people to come to your blog. Build a microbrand that is diversified. You need to experiment to learn what’s working. Run one or two new experiments a week. Patel talks about teams that come up with ideas Monday, implement by Wednesday, and decide by Friday. Smaller organizations and individuals can’t implement them. There’s scant evidence they work well even for larger organizations, and there are huge risks to betting heavily on Walled Gardens. Why do I say smaller organizations and individuals can’t implement them? Because they don’t have a team of people who can try two new experiments every week. And even if they did, they don’t have enough traffic to see statistically significant results that quickly. Look, Neil and his bigger clients can do things you and I can’t. That doesn’t mean we should try anyway. It means we need to find different strategies that work for us. Should we test as many alternatives as we can? Yes! I recommend and do this myself. But I’m here to tell you it takes a lot of time. And once you do discover what works, you need to double down there and focus. Is there any evidence that a massive diversification strategy that embraces Social Media, Advertising, and all the other possibilities aside from organic search works? But consider, how many bets can your organization place and how effective will they be? Can you afford to make a first class effort on a source that only delivers 13% of your traffic? Do you really think you can double that? I’d love to see some real examples of real organizations that are relatively small with few resources that get large traffic, the bulk of which is not Search based. I don’t believe they exist, but I’m open to counter-examples. FWIW, I have gone through literally hundreds of site profiles looking at this mix of traffic sources and have always seen Search dominate except for the sites too small to get much Search. When the Top 15 Digital Marketing Masters show up with the same profile and presumably know everything there is to know about Digital Marketing, it’s hard for me to believe this will change very quickly. What strategies would I advocate given the direction I see search algorithms going? Own your own platform, don’t rent. You can’t count on Social Media and other rented platforms. 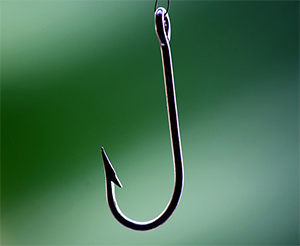 Don’t bet on advertising, you can’t afford anything but well-targeted ads. Test and then Focus on what works. What you should test and therefore what works varies depending on where you are in the Lifecycle of Generating Traffic. In the long run, all roads lead to Search, so plan your journey with that destination and learn to get Search right. Let’s dig in to those ideas! Social Media? Do you want to be the rancher or the cattle? 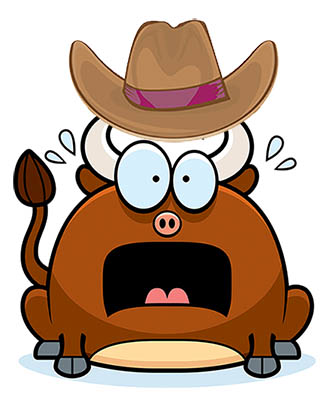 Would you rather be the rancher or the cattle? If you own your own platform, and anyone can find it through search, you’re the rancher. If you built your web presence on someone else’s platform, perhaps Facebook, Medium, Instagram, or any number of others, they own the ranch, you are their cattle, and they can send you to the slaughterhouse any time it benefits their business. It continues to this day. Imagine betting your business on Facebook. Things go great for a while. Then one day you wake up, chart your progress, and discover you get half the traffic you had a year ago. Neil worries this can happen in Search (I don’t think so as I’ve explained), but we don’t have to speculate, it already has happened in Social Media. Jumping back into this boat because you’re afraid of what might happen on Search is not your best strategy! For more detail, check out my article. Every piece of advice I come across on advertising suggests it only works when it’s extremely well targeted. Otherwise, it’s just too expensive. 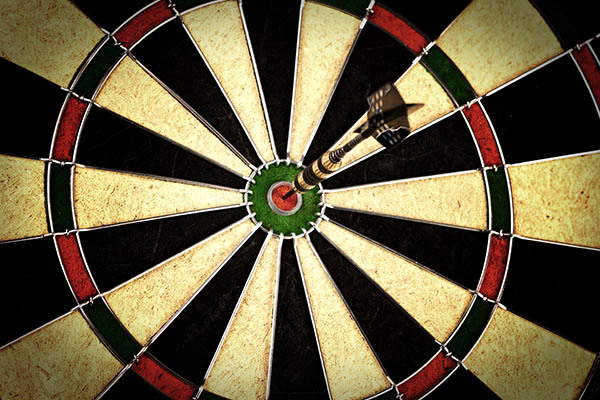 Even Neil Patel says, “Money is won or lost on targeting,” when it comes to Facebook advertising. What you’ll find when you do the math is that unless your product is very expensive, you can’t afford to scale with advertising. At best, you can ad a little bit to your business. Scroll back up to those traffic breakdowns above, the green boxes. The average Top 15 Digital Marketing Master gets just 0.04% of traffic with ads. Neil gets even less. Does that mean advertising won’t work? Heck no, or the numbers would be 0%. But it means that only the most highly targeted audience that is ready to buy now can be reached effectively with advertising. Like I said, not enough to scale, just enough to be a nice additive segment for a part of your business. And that’s only if you have the skills, resources, and budgets to manage to be successful. Neil and I do agree on the idea of testing to find out what works. But, perhaps we disagree on what and when to test. You start out just trying to build a site that creates a good impression in the unlikely event anyone discovers it. Then, you need to drive some traffic. Your site is not strong enough to garner search traffic, so you need to borrow traffic from other sites. This “Borrowed Traffic” stage is where all that traffic source testing needs to happen. 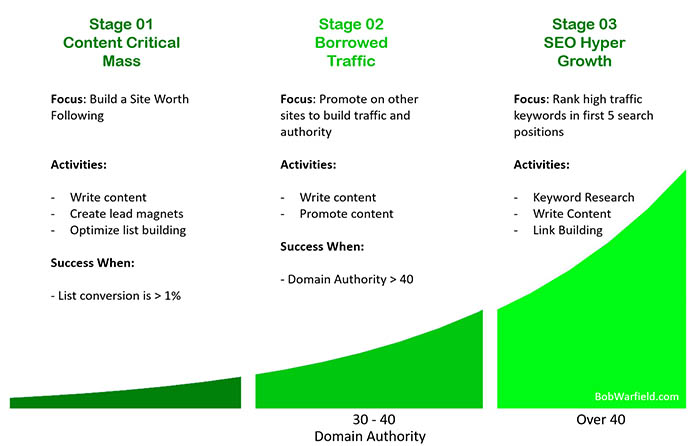 Once you have enough Domain Authority to start ranking for decent search terms, you need to focus on Search traffic. It is the cheapest most plentiful source. There’s a possible Stage 4 “Diversification” stage. Here, you’ve mastered search and are growing about as fast as you can. 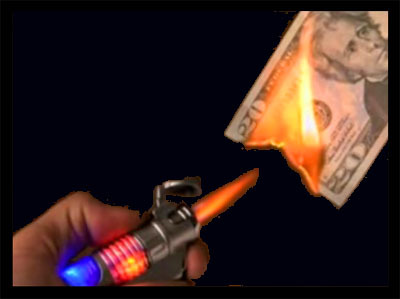 You’ve got budget and resources to burn and want more growth. So you’re willing to invest in a big effort to see if YouTube or <Insert Favorite Other Bet> can add another 10% to your traffic. Until you get there, stick to this plan! And remember, all roads lead to Search, so work towards it (building your Domain Authority so you can rank) and learn how to do SEO right (based on Google’s Algorithm du jour). More details available in this article. Now let’s talk about the right strategies to win with Search. In a world where Google’s Algorithms (and anyone else’s too) are cost-constrained, they will focus on the Short Tail. They can amortize cost over much larger volumes in the Short Tail. If your site has been living too much on super high volume Short Tail keywords, it’s time for you to start owning the Medium and Longer Tails. That’s where all the searches the algorithms don’t understand well and the world at large doesn’t compete for well will go. You have to give them more data than the IRS just to see a White Paper. And you know it’ll only lead to some Salesperson trying to pressure you into buying now. All the content talks about nothing but why their products are awesome, how successful their customers are, how lousy their competition is, and why you must buy NOW. That’s how marketing used to be done, back when the advertisers controlled everything. But the world doesn’t work that way any more. The funnel is deeper and has more steps than ever before. You want people visiting your site who have no intention of buying anything from you today, tomorrow, or even in the next year. You want to make them loyal so they come back again and again. You want to build a long-term relationship with you where they respect you for giving them valuable content and not asking for much of anything in return. That’s what real Content Marketing is. And you can’t fulfill the needs people have that make real Content Marketing effective by answering a single voice query with a single answer. That Voice stuff is mostly only good for Bottom of Funnel. It’s unclear whether they can even do much evaluation with it. So, don’t attack Voice head on or run from it screaming–move upstream in the process. As I wrote in my article on Google’s Rankbrain, search algorithms are increasingly focused on Intent. If you want to do SEO, you have to do it in terms of Intent. There’s sort of a maturity of SEO understanding hierarchy at work. Initially, people want to think about pages. They’re tangible, they’re what we create, we can see them and get our arms around them. Then, we learned about keywords. They’re closer to how Google “thinks” and we have more success focusing on keywords than keywords. But, especially in the era of Rankbrain and more AI, keywords don’t work either. Just as a single page can rank for many different keywords, a single Intent can involve many keywords too. To get a proper match and optimal results, you must target pages to Intent. A good search result delivers value, quality, and completeness for the user’s intent, not your intent. Once you embrace the idea of targeting intent, don’t stop. The job of a search engine is to find the best answers for intent and your path to having them choose your page is to make sure it has the most value, quality, and completeness. All of that must come before trying to convert your user, because if they don’t land on the page, they’re not going to convert from anything on that page. Isn’t there anything we can do to target Voice Search? After all, it is the new, new thing, and I know you want to get involved with it somehow. Your best route to getting noticed on Voice Searches is to target Conversational Queries. Answer questions, for example. Google and tools like KWFinder (my favorite keyword research tool) can help you find the most commonly asked questions. Seek out articles on how to grab the Featured Snippets and you’ll have more good fodder. I have a modest wager about AI going with Google’s Avinash Kaushik. I took him to task for his AI predictions and he came back and bet me that in 5 years I’d agree that 80% of what I’d said was, “demonstrably imprecise.” I don’t know what that even means (do you? ), but the bet is only for a cup of coffee, so I happily signed up. Didn’t come from Voice or Personal Assistants. Was assisted by SEO where’s I’ll define SEO as, “any best practice that is designed to influence search algorithms.” That could be choice of keywords to target, how those keywords appear in an article, completeness of the article so it covers the topics the search engine expects, links, and all that sort of thing. That seems to me to be plenty of reason to conclude in 5 years that SEO is not dead. And people, if it ain’t gonna happen in 5 years, why worry about it now?